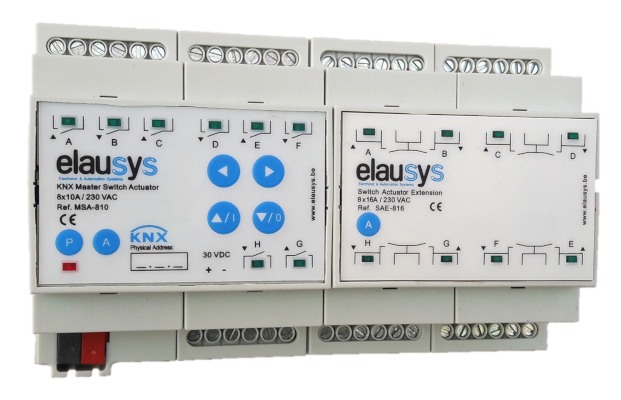 The Universal KNX Actuator System is a fully modular actuator system where extension modules can be plugged-in to extend the number of output channels as needed. Up to 72 channels can be used for switching, shutter or blind functions with various size and power. Extension modules can be plugged-in next to the master module to add extra channels for switching, shutters or blinds. Versions are available in 4 or 8 outputs with rated current of 10A or 16A to fit exactly to your need. Up to 8 extension modules can be added to the master actuator. 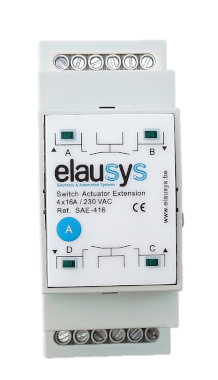 Depending on the extension type, you are able to drive up to 72 outputs with the actuator system using a single KNX interface. The system uses limited space with compact modules. The Master actuator is made for mounting on DIN rail and covers 4TE. Extension modules with 4 channels cover 2TE and 8 channels cover 8TE. Each channel of the universal actuator can be configured as a switching actuator or a shutter actuator, this gives a high level of flexibility and can be used in any application. Therefore, the universal actuator combines the advantages of the shutter actuators with the one of the switching actuators. In shutter/blinds operation the relay contacts of the actuator can be used to control electrically driven blinds, shutters, awnings, venting louvers or similar curtains for 230 V AC mains voltage. Alternatively, the actuator can switch electrical loads, such as lighting systems in switching operation. The controls (4 pushbuttons) on the front panel of the master device permit switching the relays on and off by hand in parallel with the KNX even without bus voltage or in a non-programmed state. This feature permits fast checking of connected loads for proper functioning. MSA-810 is the master module of the KNX universal actuator system. The master switch actuator is driving the complete system with up to 72 channels using extension modules. The master actuator already includes 8 channels 10A. It allows to configure switching, shutter or blind function on any of the channels. Switching extension 8 channels 16A / 230VAC for the universal actuator system. It allows to configure switching, shutter or blind function on any of the 8 channels. Each channel is rated at 16A and has two screw terminals to facilitate the connection of multiple wires. Very low consumption is achieved thanks to the use of bistable relays. 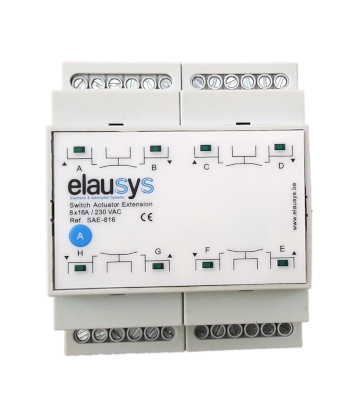 This extension module is used together with the KNX master module MSA-810. Switching extension 8 channels 10A / 230VAC for the universal actuator system. It allows to configure switching, shutter or blind function on any of the 8 channels. Each channel is rated at 10A. 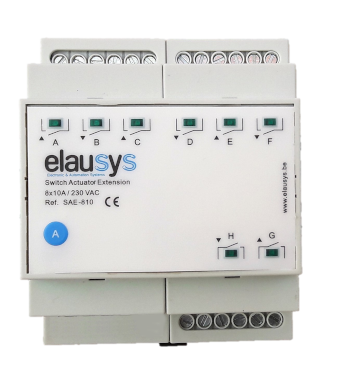 This extension module is used together with the KNX master module MSA-810. Switching extension 4 channels 16A / 230VAC for the universal actuator system. It allows to configure switching, shutter or blind function on any of the 4 channels. Each channel is rated at 16A and has two screw terminals to facilitate the connection of multiple wires. Very low consumption is achieved thanks to the use of bistable relays. 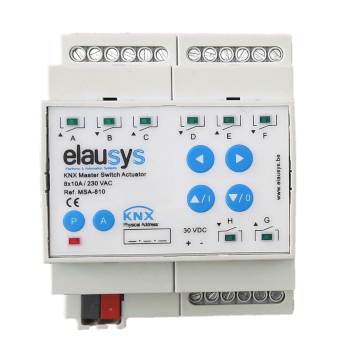 This extension module is used together with the KNX master module MSA-810. Visit our web shop !